Access your copy of the Disruptive Mobile Analytics Whitepaper by completing the form below. 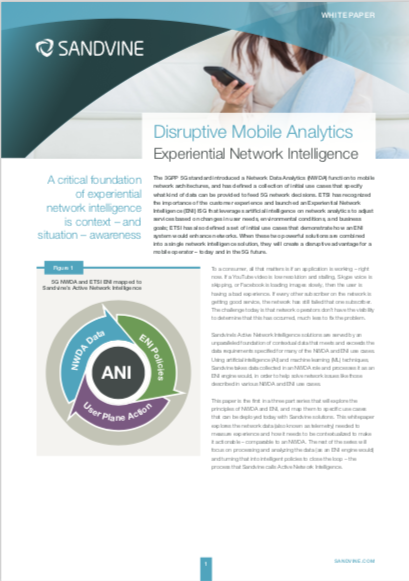 In this whitepaper, the first in a series of three, you'll receive guidance on how to leverage both the 3GPP 5G Network Data Analytics (NWDA) function and the ETSI Experiential Network Intelligence (ENI) ISG and combine it with a single network intelligence solution to create a disruptive advantage for mobile operators — today and in the 5G future. Mobile operators worldwide can very quickly visualize their network performance to quickly diagnose hotspots, outliers, and overall network quality of experience (QoE). But without the right data, a mobile operator will not be able to meet the application QoE expectations of subscribers and even worse, will not know if their subscribers are having negative application experiences.